So, I am in the process of building a 15u 104hp eurorack cabinet, and I am currently thinking about the power supply/distribution. My thoughts currently are to us 1 x Power-One HCC15 (3.4A) and 1 x HBB15 (1.7A). I've read a lot about separate PSUs for digital/dirty modules to keep noise issues to a minimum. The HBB15 will just be for those. What kinda worries me, is 3.4a can fry a lot of modules if something goes wrong. How is the optional Over-Voltage-Protection circuit that Power-One offer? Will this be a good failsafe? I have noticed that FOH bus board have built in reverse polarity and voltage protection too. I would prefer to make my own Busboards, as I have been doing from stripboard. As buying busboards would cost around $250 :( Would this be overkill if I already had the Power-One OVP? Even 1.7A will fry most modules. Power supplies only put out what the modules draw from them. I think having separate PSUs for different modules is going to be a bit of a mess, but whatever flips your switch. With proper decoupling, digital modules should not put noise on the power supply rails. I put reverse polarity protection on individual modules, although I suppose it makes sense to put them on the busboard (I might just redo my busboards now...). I only tend to put them on modules with 2164s, as these are especially prone to failure with reverse power, and then only on the negative rail. I use Schottky diodes from -15 to GND (1N5818), as recommended by Neil Johnson and Oscar Salas. 1N400Xs work well for general purpose RPP. However, you should use them in conjunction with resettable fuses (PTCs), or else they can be easily fried. In other words, the diodes should only shunt current for as long as it takes to trip the PTC, and then everyone is happy. This could all go on the busboard. Just make sure that everything is rated properly. You wouldn't want your PTC to trip just because you connected one more module to your busboard. Rail noise has been a big annoyance for me lately, that's why I've been keen to split over 2 PSUs. My previous busboards are made on stripboard with a copper wire soldered along the traces to beef up the circuit. I'll look into the diodes and ptc fuses. It seems that's the way FOH do theirs. I'll be interested to know how you go with it. I'm going to have to do the same thing soon. I found these 2 files somewhere on my PC. I can't remember where i got them from (e-m.com?). Would it be good practice to include extra decoupling caps in the bus board, as this design does? I recently purchased an OVP module for my Power One supply. I haven't installed it yet. Over voltage is only going to happen with serious failure in the Supply, but the $30 or so it costs seems cheap insurance given that the supply is hooked up to many-thousands-of-dollars of modules. You could also have power zener diodes on the bus boards to catch over voltage, but you need to be SURE that the PS fuse blows before the Zener burns out. I think for that price it is worth the piece of mind. I'll be ordering the OVP with my PSU. One other question: with the reverse polarity protection diodes, does the voltage drop cause any issues? I suppose i would trim the PSU to supply 12v at the busboard output sockets? I haven't ordered yet, but will be soon. I'll update when I do. i would like to see your layout and finished piece when you are done with this. i am guessing many others would like instructions and a layout of a good high powered power supply interconnection. speaking from experience, using a power one HC-3-A (I believe) I once had a power transistor fail from overheating. The result was +30 volts and a fried model 15 oscillator. I would definitely go with an over voltage protection thinger. I'm in the process of upgrading my entire rig. 12U. I went with an HDD-15-A (I think thats the model, its the 5 amp version and Im too lazy to walk into the other room and check) and I bought the OVP to go with it. Its $12 and great insurance. It looks like I'll be building this on stripboard. I toyed with the idea of designing a PCB and getting some made, but the added complexity might not be worth it. I will post a schem and pics when I figure it all out. I did the layout on those boards, there's also room for a 5volt regulator (which will get quite hot if you are pulling a lot of current, but since at least in my modular there are not that many modules which need this rail, so I didn't put a heatsink on it, but it'll need to drop 7-10v). Reverse power protection makes sense on the module, not the bus board. Since the usual cause of problems is plugging a connector in backwards, having the protection before that connector won't prevent you plugging it in backwards. true - but if you have several busboards only the modules connected to one of them can be damaged. Well, reverse polarity protection on the busboards will prevent you from doing any damage when connecting them, but you do that only once, when building the cabinet, with no modules present, and you check afterwards. Plugging in modules is done much more often, and they can have different orientatiln of the connectors, they can be close together etc. etc. And, you cannot really check afterwards. So, more prone to mistakes. No problem to add protection, it'll just cost you a volt or so on the rails. Question: If you connect two modules without reverse polarity protection to a busboard, can one of the modules be damaged by reversing the polarity on the other module? I always assumed this is the case, hence my want for RPP on the busboards themselves. I was thinking of a diode on each header, not just between the PSU and the busboard. Maybe I'm over complicating things? PS: Jarno, thanks for making your design available to the DIY community! No problem, I don't think I have all the files with me (at work), but I'll upload them tonight (so schematic, layout, and PCB can be kept together). By the way, the PDF is not protected, so if you download inkscape, you can add whatever you like. Don't think you can damage a properly connected module by plugging in a reverse connected one, I am assuming the rail voltage will short somewhere and drop to zero. While I type this, if one of the rails drops and the other one stays up, that can damage modules, had a single rail fail when I just started to build my modular, and it took out all actives on the MFOS Dual log/lin VCA. Ironically, I can't find the schematic anymore. But here are the layout and PCB file for the bus board, I rotated it, so it fits on a A4 sized sheet of paper. Plugging one module in backwards won't reverse polarity on other modules. However there is one specific situation where plugging a module in wrong could short the +12 and +5v lines together. This could potentially put more than 5v onto the 5v rail, and damage other modules that use 5v. It can also short out one rail causing other modules to be running from just one rail. In most cases that isn't a problem, but there might be some modules where that could potentially cause damage. So plugging a module in wrong won't cause the same kind of damage to other modules that plugging them in backwards would, but in a few specific cases it is possible that it can damage other modules. I was thinking of a diode on each header, not just between the PSU and the busboard. Well, that is a lot different than what I imagined you were talking about. It would of course require 3 series diodes per connector to protect all rails. And it would drop the voltage on all rails. Schottky diodes have the lowest drop, but will still drop the voltage between .2v and about .5v depending on the current used. While you can bump up the voltage going in, it won't fully compensate since the voltage drop changes with current and temperature. And a fluctuation with current will then cause the power rail to fluctuate a bit. A module can be designed with that type of protection built in, when the designer takes the effects into consideration. But to add it to every module could end up with some of those modules not working as well as they were designed to. Awesome, this is exactly the kind of info I need. Thanks. So I guess I will leave out the reverse protection on the boards. It seems a little over complicated for the amount of extra protection it will provide. I'll post some info when i get the psu/bus boards installed. Tonight I start the woodwork part, which is exciting. What kind of caps did you use for c5 &c6? I would assume something like 10uf electros? 5&6 and 3&4 are 100n filmcaps the polarised caps can be what you can fit on there, a brand/type/voltage specific, i usually try to get upwards of 47uf on there. I am now considering just using the one 3.4A PSU. I plan on mounting a screw terminal distribution block as close to center as possible. THis is where the sense terminals will be connected. Is it good practice to use the same length cable from this central point to each busboard, even if they are different distances from the central point? I've drilled some holes for ventilation behind the PSU, hopefully this will be adequate. So how does one hook up an OVP12G to their power-one PSU? It only has two wires,+ out and- out. That supply (I have one) in that cabinet may produce a slight audible hum. 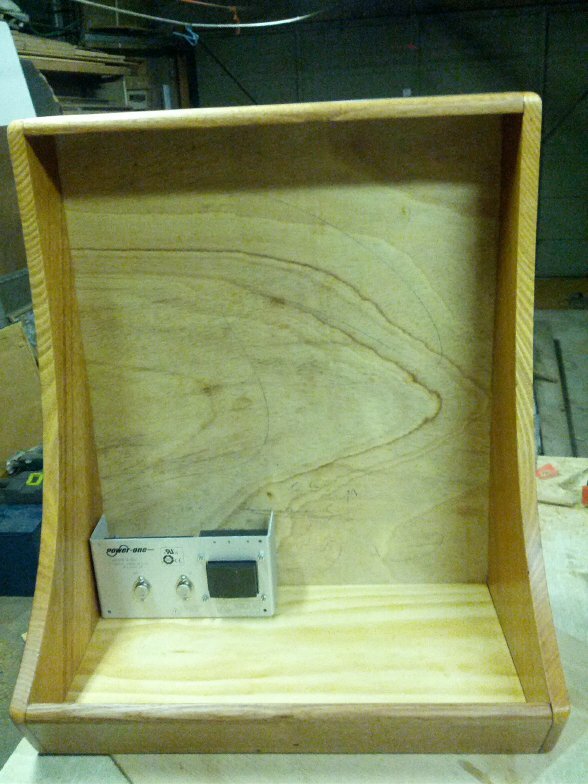 I'm talking about vibration from the transformer coupled into the resonant wooden cabinet. In my current setup it isn't a problem. Depends on the cabinet and how the PSU is attached to it. More load will increase the hum. For cooling, keep in mind that all of that aluminum constituting the frame of the PSU is a heat sink. Wood is a terrible conductor of heat so you want to use spacers so air can flow over all the surfaces. If your actual load is well below the capacity of the supply cooling becomes less of an issue. Does it have only a single output voltage perhaps? Then you need two to tango. The schroff PSU's I bought on eBay are bipolar so they have two sets of terminals, one for each output voltage. These are floating, so you connect one "-" to GND and "+" of the other output as well, the "+" of the first will be the most positive terminal, GND will be in the middle and the "-" of the second set of outputs will be the most negative terminal.